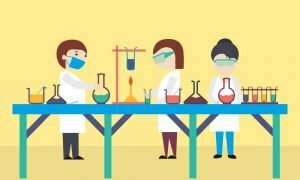 Should you be an Experimenter? Or a Systemiser? I’m on a mission… to help small business owners find the right systems and technology to save them time and money. I’ve been on this mission for a few years now but I’ve often struggled to articulate how I can help people. I knew that deep within me there was a simple way of explaining to people what they should be looking for and recently, after creating some new content for a conference event, I got the missing piece of the puzzle. This has lead me to create what I am calling the SORTED Framework. It enables you to defend yourself against well intentioned advice and over zealous sales people and work out what systems and technology are appropriate for your business right now. The Framework [I know, a bit serious but if you have a better suggestion please do let me know] is based on 2 simple rules and is designed to help you identify what systems and technology are appropriate for your business right now. Most of my clients are sole traders or in a team of no more than 5. When I start talking about departments it is easy to dismiss this as something that might happen when you are bigger but getting your departments sorted out early on is key to a calm and stress free business. Let’s think about a big business. It will have a sales and marketing team that is responsible for getting the customers through the door. The clients they attract are then served by the operations team who are responsible for the ‘doing’ bit of the business whether that is a product or a service. The third area of the business is the support services such as Finance who make sure that you get paid, IT, HR, Facilities and Security. All these support services together make up a back office. 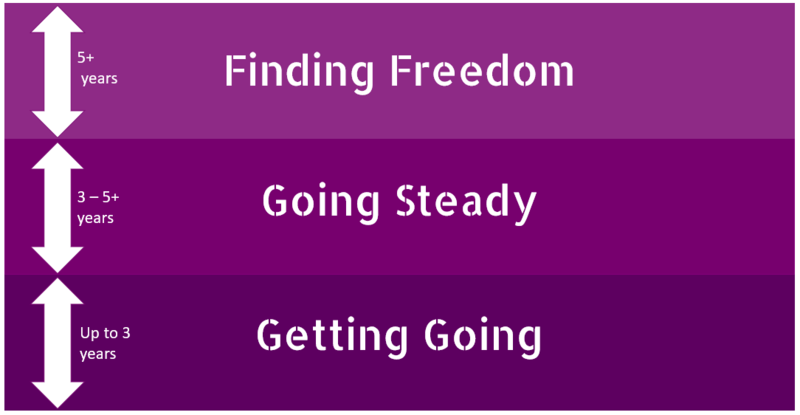 Each of these three areas are critical to the business succeeding and if you took one out then the business would fail. 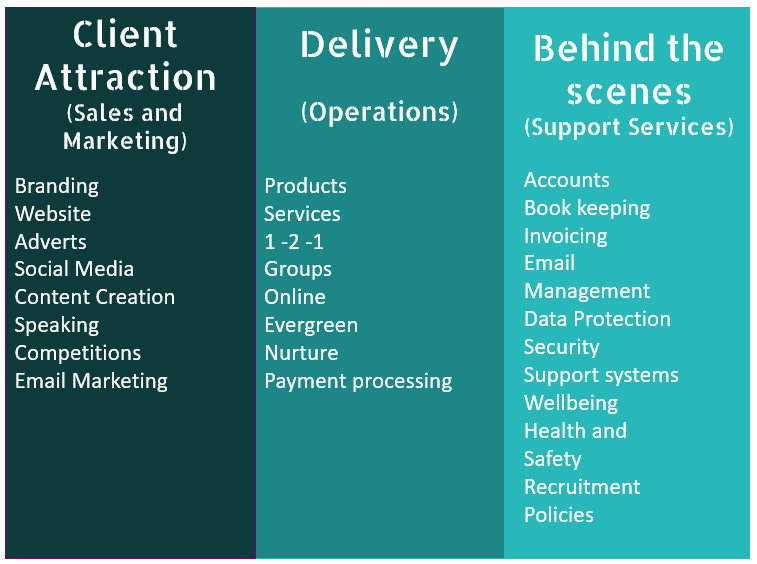 In a small business it is very easy to ignore the need for these 3 departments and focus on operations or sales and marketing and let the other areas slide. Acknoweldging you need the 3 departments and taking steps to ensure each department gets time allocated to it will reduce stress and improve cash flow in your business. These are Getting Started which lasts for about 2 years for many businesses but can be longer. This is the stage when you are finding out exactly what it is you want to do and learning how to speak to your clients in a way they will understand. Once you have some ways of working that are repeatable and you know will bring in some sales you have reached the Going Steady phase. Congratulations! Many people are happy to stay at this level forever, adding a few new things from time to time and tweaking their offer and that’s great. Some people will want to move to the third level which is Finding Freedom. Finding Freedom is the stage where you start to extract yourself from the business so that it can run itself. This could mean that you bring staff in to do the work or you use a franchise model to expand your business. The key is that you are doing less and less of the work yourself. Which leads me to the SORTED Framework. And what has all this got to do with whether you are an Experimenter or a Systemiser? If you are in the Getting Going phase then you should be Experimenting. You need to be working with an open mind and be ready to play with the way that you work to find the way that works best for you. Don’t feel like you need all the answers, it’s fine to have a few unexpected explosions along the way! Once you know what and how and are in the Going Steady phase then you can sell you product or service then you are ready to start Systemising! This will make running the business more straightforward, requiring less mental effort from you and allowing others to start to help you as you reach the dizzy heights of Automation and Delegation which will eventually lead to the Finding Freedom stage. Do let me know if this makes sense for you and if you can see where you would sit in the matrix and how it might support you to work out what systems and technology would support you best. Then I can really help you to get SORTED!